Big investors are pushing supermarket chains and food companies to be more aggressive in tackling deforestation in their supply chains in order to be less exposed to the risks of climate change, reputational damage and environmental regulations. In July, investors managing more than $2.8 trillion in assets, including the U.K.'s Legal & General Investment Management and the Netherlands' Robeco, called on soy and meat companies to take "immediate action" to halt forest loss in Brazil's Cerrado region, which has already lost half its savanna to agriculture. A month later, more than 90 institutional investors, including the California Public Employees' Retirement System, the biggest U.S. pension fund, called on the Roundtable on Sustainable Palm Oil, or RSPO, to strengthen its standards for certifying sustainable production of palm oil, which is found in nearly half of all packaged products, from cosmetics to candy. In November, RSPO tightened its guidelines. In September, BNP Paribas' asset management arm and 43 other investors that together manage about $6.4 trillion in assets issued a statement exhorting the cattle industry to eliminate deforestation in South American cattle production. "There are three areas of concern," said Helena Vines Fiestas, head of sustainable research and policy at BNP Paribas, in an interview with S&P Global Market Intelligence. "There is the potential financial impact on a company's bottom line," the reputation risk for consumer-facing businesses and the potential impact on local communities directly affected by deforestation. 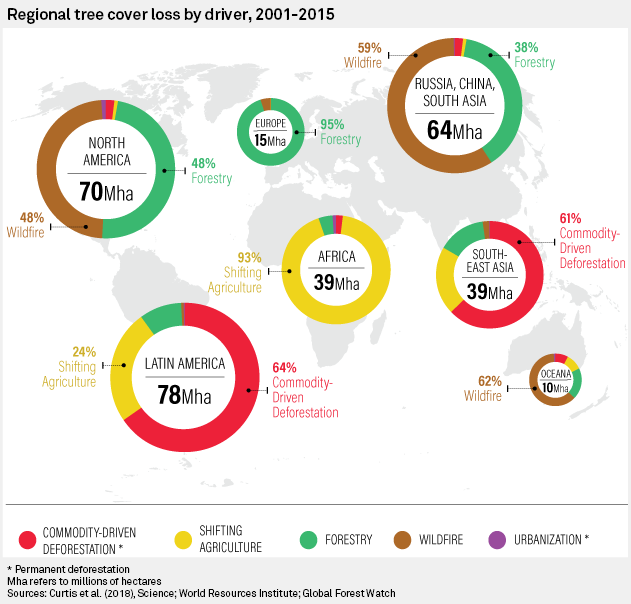 Globally, more than 120 million hectares of forest have been lost since 1990, an area almost the size of South Africa, and commercial agriculture is responsible for nearly 70% of tropical deforestation, according to the World Economic Forum. The second-worst year for tropical tree cover loss was 2017, according to satellite-based data from the University of Maryland. Last year, 39 million acres were destroyed, equivalent to losing 40 football fields of trees every minute for an entire year. Deforestation is mainly spurred by four products: cattle, palm oil, soy and timber. Deforestation has a double effect. When trees are cut down, they can no longer absorb CO2. In addition, burning or rotting trees release vast amounts of CO2 into the atmosphere. About 24% of global greenhouse gas emissions originate from agriculture, forestry and other land use — more than the 14% from the entire transportation sector, according to the U.S. Environmental Protection Agency. For years, nonprofit entities such as the World Wide Fund for Nature, or WWF, and Greenpeace have used corporate shaming campaigns to draw attention to deforestation. Now, alerted by investors to the financial risks, food and consumer goods companies are responding. After all, their exposure is significant: about $941 billion in revenue in publicly listed companies is dependent on commodities linked to deforestation, including cattle, soy and palm oil, according to CDP, a group that collects environmental data from businesses. Of the companies that report to CDP, about 87% identify risks from deforestation and nearly a third say those risks are already having an impact. "Especially for consumer-facing firms, deforestation can have an impact on the brand's equity and affect their reputation," said Julie Nash, director for food and capital markets at Ceres, a nonprofit group that works with investors and companies, in an interview. In 2016, 27 large buyers, including Kellogg Co., Cargill Inc. and Mars, suspended procurement contracts with major palm oil producer IOI Corp. after claims that it had illegally cleared about 45 square miles of forest and peatland in Indonesia; the suspension hit IOI's bottom line. Similarly, in May, Unilever said it would suspend palm oil orders placed with Yemen-based Hayel Saeed Anam Group because of reports that two of its units were alleged to have destroyed part of the rainforest in the Indonesian province of Papua. Mondelez International Inc., maker of Cadbury sweets and Oreo cookies, has come under significant pressure for links to palm oil suppliers that cut down Southeast Asian forests. In November, the confectionery giant said it was dropping 12 upstream suppliers "as a result of breaches." In 2017, cocoa producer United Cacao became insolvent as a result of regulatory and legal challenges arising from illegal deforestation in Peru's Loreto region. In late 2017, reports claimed that a unit of Posco Daewoo, one of Korea's largest trading companies, had been involved in a Papua deforestation program. Soon after, the large Dutch pension fund ABP sold its shares in the parent. "Measures that our investors proposed were not picked up quickly enough" by Posco Daewoo, said ABP in a statement this June. "As a result, we no longer had confidence that the company would improve." Such efforts have had a tangible impact. In Indonesia, for example, primary forest loss fell 60% in 2017, according to the World Resources Institute. The majority of global palm oil production today is covered by some form of no-deforestation commitment. However, because palm oil supply chains are so entangled and complex, the policies are often not fully implemented, according to an analysis published in the journal Global Environmental Change in May. There are other barriers. In 2017, less than a quarter of the 838 companies CDP approached on behalf of investors responded to the request for information about their exposure to deforestation-related risk. Global Canopy, a nonprofit organization, recently tracked deforestation commitments across 250 major companies. It said that as of late 2017, only 16% had an overarching no-deforestation policy, and about 40% had a forest policy for one, but not all, of the commodities in their supply chains. "The main surprise is that cattle hasn't had that much attention," said Sarah Rogerson, researcher at Global Canopy, in an interview. Beef production is the world's leading driver of tropical deforestation, responsible for 65% of gross deforestation from 2001 to 2009, according to Ceres. This occurs primarily in Brazil and other parts of South America through the conversion of forest to pasture and from growing soy for cattle feed. Deforestation remains a major concern in the Amazon and increasingly in the Cerrado, a wooded grassland covering 20% of Brazil. Chinese companies buy 80% of Brazil's entire soy exports, mainly to feed chickens, pigs and fish, but deforestation is often not on their agenda. "It's hard to engage with these companies," said Danielle Carreira, a senior manager at Principles for Responsible Investment, a nonprofit group, in an interview. "They respond to regulators, not shareholders." U.S. food companies also have some catching up to do. "The U.S. lags behind Europe, but it's changing, especially when it comes to deforestation and the production of soy," said Robert-Alexandre Poujade, an analyst focused on environmental, social and governance issues at BNP Paribas' asset management business, which has €557 billion under management. BNP Paribas recently hired a U.S. head of corporate stewardship to engage more thoroughly with American companies. Shareholders are stepping up their efforts where they can. In December 2017, Boston-based Green Century Capital Management Inc., with $550 million of assets under management, filed a shareholder resolution with major U.S. agribusiness Bunge Ltd. seeking commitments that extended to both illegal and legal deforestation across Bunge's global supply chain for soybeans. In addition, Green Century asked Bunge to develop a process to ensure that soy suppliers in South America were compliant and to lay out steps to deal with any noncompliance. "In the Cerrado, deforestation has caught the attention of NGOs, so Bunge is in the position of being targeted by activists," said Leslie Samuelrich, president of Green Century, in an interview. "They are a publicly traded company, so that puts them at reputational risk." Bunge also faces operational risks. "As deforestation drives climate change and changes weather patterns, soy production can be affected in the short and long term," Samuelrich added. "It's in their interest to not have an unstable climate." Bunge gave Green Century the commitments they sought, and in April 2018 the fund withdrew its shareholder resolution. Among major companies, Unilever PLC and Nestlé SA have been especially aggressive on deforestation. In the last two years, Nestlé reshuffled 10% of its global palm oil supply chain in response to suppliers that were linked to deforestation or that refused to change their practices. The Swiss food giant has dropped 10 such suppliers from its supply chain. In addition, the company says 80% of its soybean volume is now deforestation-free. "By 2020, I have no doubt that it will be entirely covered," said Benjamin Ware, global head of responsible sourcing at Nestlé, in an interview. Earlier this year, Nestlé deployed a satellite-based monitoring system called Starling to keep an eye on its global palm oil supply chain. From March 2019, anyone will be able to access a "transparency dashboard" on Nestlé's website. It includes a world map that allows a user to zoom in and see where palm-oil products originate from and whether they are certified deforestation-free. Nestlé said it intends to later expand the dashboard to soy, coffee and other products. In 2010, Nestlé made a public commitment that it would end deforestation in its supply chain by 2020. Will it get there? "By January of next year, we'll be at 75%," said Ware. "We will do our best to reach 100% of our target."